Order now and receive free freight! American Hot-Dipped Galvanized Wedge Anchors are in stock for immediate shipping. 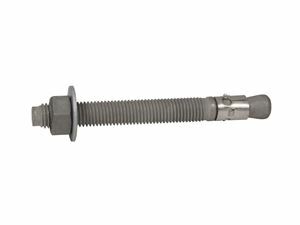 The American Hot-Dipped Galvanized Wedge Anchor is designed for use in solid concrete, and should never be used in other base materials such as brick or block. Longer length American Hot-Dipped Galvanized Wedge Anchors fasten thicker materials to concrete and are not used for deeper embedment. Ability to view one size anchor to the next by clicking on the blue highlighted American Hot-Dipped Galvanized Wedge Anchor descriptions at the top right and left of the page.